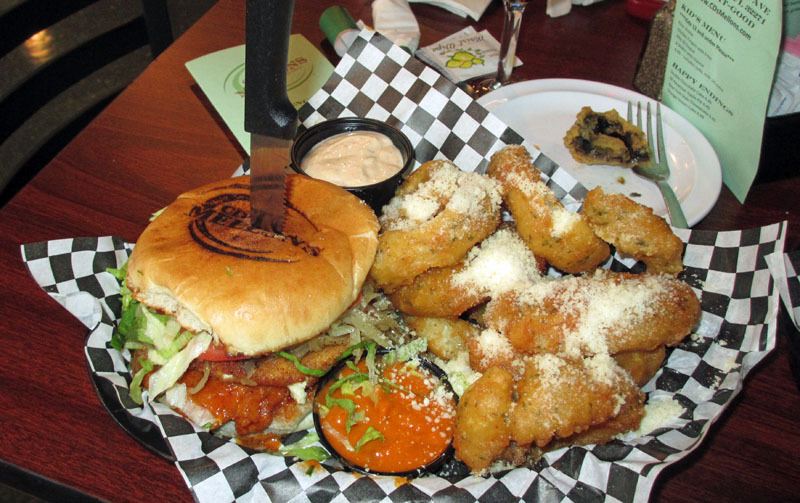 We decided to give the newly opened CD's Mellons Bar and Grill a try recently, and I'm glad we did. Good food was our quest, and we found it. We arrived around 6:30 or 7 on a Friday night. They were not very busy and most of the business seemed to be around the bar. As we sat there, I noticed a number of to-go orders going out though, and several patrons eating at the bar. We were quickly greeted by our waitress, Jacqueline. She was fast, friendly and knew about the items on the menu and knew how they tasted, what was in them, etc. Very impressive. We started out with a glass of wine, a decent pour at a decent price. 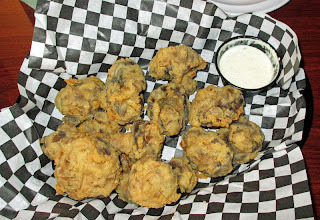 For an appetizer we ordered the Hand Breaded Fried Mushrooms. They came out fresh and very hot, with a nice horseradish dipping sauce. They were very good. The breading was not thick and overpowering, and they were not at all greasy. The mushrooms were large and very tasty. I'd order them again. 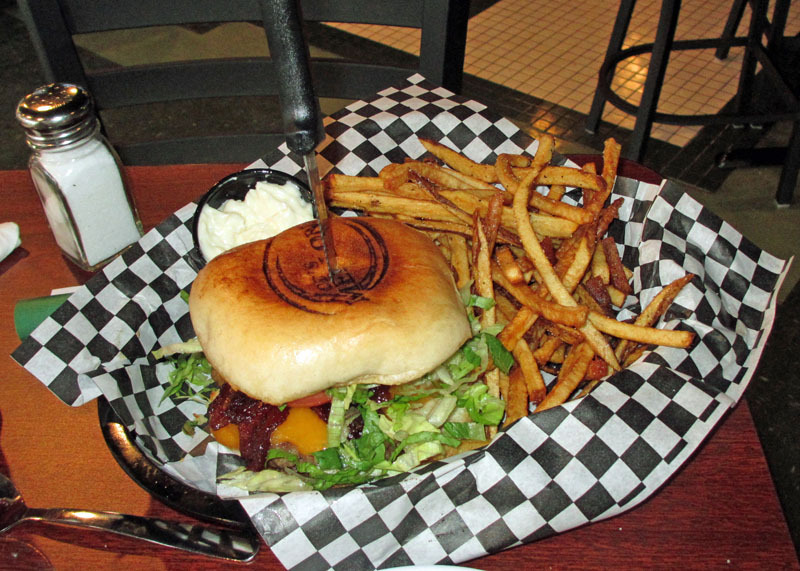 For his sandwich, Tommy had the Bacon Cheeseburger with cheddar cheese. OMG. It was piled high with topings like lettuce, tomato, and onion. It was a delicious sandwich. Now, though he ordered it medium, in truth it was more like well done. fortunately, all the toppings helped it to stay moist and juicy and it was a very tasty sandwich. The cheddar cheese really stood out as well. The accompanying fries were excellent. The appeared to be hand cut, with the skins on, and were perfectly cooked and seasoned. Again, not overly greasy as well, a sign that they were cooked at a proper temperature. I had a bite of the burger and more than a few fries and agree, it was all darned tasty. For my sandwich I had the CD's Mellons Signature Buffalo Chicken Sandwich. Wow, it was very good. The chicken was fried and moist and tender. The blue cheese was some sort of blue chees croquette, almost like a slice of cheese. The taste of the sandwich was great, it had a nice hot buffalo sauce taste, the chicken was tender, and the taste of the blue cheese added to the experience. My only complaint is not really a complaint, but it was messy. 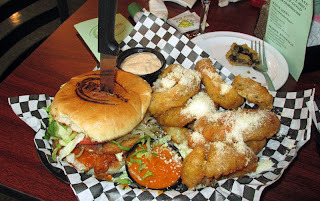 I went through a number of napkins eating this sandwich and as it got to the very end, it just sort of fell apart. But that's OK, I was full. Fortunately our waitress knew what the sandwich was like and provided wet wipes....she knew I'd need them, and I did. But it was a very good sandwich. I ordered Onion Rings to accompany mine, and they were about the tastiest onion rings I've had in a long, long time. Thick slices of sweet onions were breaded in a tempura-like batter that was nicely seasoned. Then when servers, a dusting of Parmesan cheese over them put these over the top. They were delicious. I really have no major complaints. We had a great meal and a great experience. At the end of the meal the bartender came out and asked me to sample a bit of a new wine, which I did wholeheartedly, a tier 2 cabernet. It was good. As we got to talking, eventually one of the owners joined us. We had a nice conversation. CD's Mellons Bar and Grill is a sports bar. It seems to me it's be a great place for a bite to eat late in the evening, or for a quick lunch during the week. They are a new place and I wish them well. I think I'll be back, for sure. I want another helping of the O-rings and there are a few other things on the menu I want to try! We went to Habaneros Mexican Grill in Sanford (Seminole Town Center Mall) recently for dinner and were hopeful for a good experience. Unfortunately, it was not to be. Mediocre (at best) food, spotty service, and a lackluster atmosphere left me longing for some good Mexican food. I doubt that I'll return. It's not that the food was bad--it just was not real good. We started with some chips and salsa. Tomato sauce out of a can was about the taste and consistency of the salsa. Not at all inspiring. For Tommy's main dish he had the Chicken Fajitas. They were OK. Not bad, Just not spectacular. For my dinner I had the Enchiladas, one each of cheese, beef, ground beef, and chicken. They were OK, but again, nothing special. For a go-with, there were refried beans. Again, nothing special, could have been (and probably were) dumped from a can and heated. Not at all special. Sorry, but I don't think I'll be back. There is much better Mexican food in Sanford, and it's not to be found here. But, feel free to see for yourself. Just remember, I told you so!